Martin Frimmer, a post-doctoral researcher in the group of ETH professor Lukas Novotny, explains the working principle of a sensor very plausibly: "First I need to know how the object acting as a sensor is influenced by its environment. Anything that happens beyond that influence tells me: there is a force at work." In practice this usually means that interactions with the environment should be kept at a minimum in order to maximize the sensitivity of the sensor to the forces one wants to measure. The scientists achieved precisely that by trapping a silica nanoparticle, whose diameter is about a hundred times smaller than a human hair, using a focused laser beam. 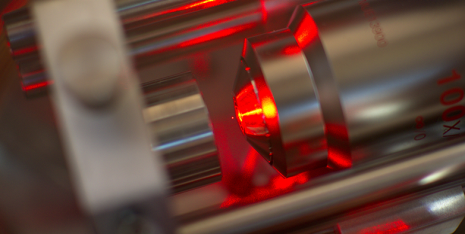 The beam creates "optical tweezers" in which the nanosphere is held in the focus of the beam by light forces. If an additional force acts on the sphere, it is shifted from is rest position, which in turn can be measured with the help of a laser beam. To measure the charge carried by the sphere at any given moment, the physicists exposed it to an oscillating electric field and observed how strongly the sphere reacted to that. In this way they were able to confirm that the charge of the sphere changed in steps of exactly one elementary charge (i.e., the charge of an electron) to the negative or to the positive. When the high voltage is switched off, the sphere's instantaneous charge remains constant for days. In this way they were able to confirm that the charge of the sphere changed in steps of exactly one elementary charge (i.e., the charge of an electron) to the negative or to the positive. I know we have all become blasé about single atom images and somesuch. But to me the ability to make single electron effects visible still boggles the mind.